Matrimony is in the air as society gathers at Kingstag Castle for the Duke of Wessex's wedding. But who will be the bride? With swoon-worthy lords, witty ladies, eccentric relatives, a gaggle of free-spirited girls, and the world's best high-perch phaeton, it's a recipe for mayhem… and romance. This anthology began a long time ago in a galaxy far, far away… or so it seems. Maya Rodale and I talked about writing stories set at a country estate wedding for a few years. It wasn't until 2013 that we got together with Miranda Neville and Katharine Ashe and made it happen. This was also some of the most fun I've ever had as a writer. Instead of writing my own story all by myself, I wrote it with three other fantastic writers, knowing some characters would come to life in other stories. 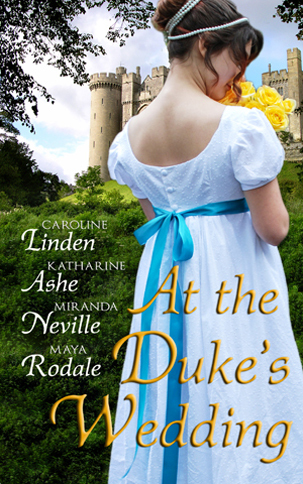 Although each novella in At the Duke's Wedding can stand alone, they are meant to be read together for a multi-dimensional view of the wedding of the Season. There are some running jokes throughout! NEW! Don't miss the sequel, At the Christmas Wedding, which picks up three years after the events of At the Duke's Wedding. We've collected quite a lot of things on our Pinterest board for this anthology. It was going to be a terrific storm. Gareth Cavendish, Duke of Wessex, surveyed the rapidly darkening sky as he stood on the steps of his country estate. Gray-violet clouds boiled up in angry billows and every few seconds thunder rumbled, as if the storm were clearing its throat, preparing to roar. But so far not a drop had fallen. "I do hope they're near," he murmured, scanning the pristine landscape of his property. "The clouds may burst at any moment." The man behind him shifted his weight. "Sir William is a very punctual man." "Yes." Gareth narrowed his gaze upon a far-off puff of dust, just visible beyond the stately oaks that lined the road leading to Kingstag Castle. A servant had been sent out to watch for the visitors' arrival, but it was still over a mile from the main gates to the house. A moment later, a traveling chaise-and-four emerged around the last turn. "There. Just as you said, Blair. Very punctual." His secretary murmured a vague reply. The carriage bowled smartly down the drive, drawing nearer. He stood a little straighter. It wasn't every day a man welcomed his bride-to-be to his home. Miss Helen Grey, younger daughter of Sir William Grey and the toast of the Season, would be the Duchess of Wessex by the end of the month. Gareth was very pleased with the match. Her father's best property marched with one of his smaller estates, and according to the marriage settlements, that land would be his one day, as Grey had no sons. It was a good match as well, for the Greys were an old and respected family, even if they had fallen on rather hard times of late. And the young lady herself was ideal: a serene, gracious manner, a lovely face and form, and a beautiful voice. Helen Grey would make the perfect Duchess of Wessex. Gareth glanced again at the sky. He hoped the storm broke soon and blew over quickly. Guests were to begin arriving the next day, and he shuddered to imagine the chaos if everyone was kept indoors for the next week. "Let us hope there are no lightning strikes, hmm?" He half-turned to flash a faint smile at his secretary, who nodded, stony-faced. Gareth took another look at the man who was not merely his secretary. James Blair was his distant cousin from a poorer branch of the family and superbly competent. He relied on him like he relied on his right arm. Normally they worked together in perfect tandem, Blair anticipating his thoughts and Gareth relying on his cousin's uncommonly good judgment in all matters. No one was more closely acquainted with his business concerns or personal matters, nor a better friend. He trusted the man completely. But now his secretary looked as though a funeral train were approaching instead of a bridal party. "All right, Blair?" he asked curiously. Blair stared straight ahead, his eyes flat. "Yes." He glanced toward the approaching chaise as an awful thought struck him. Good Lord. There couldn't be something about this marriage giving him pause, could there? Blair had conducted the marriage settlement negotiations on his behalf while estate business had kept Gareth in the country. Naturally, he must have seen Miss Grey and her family a fair amount. Alarm stirred in his chest. Perhaps Blair has seen something troubling but hesitated to bring it up now that the documents had been signed and the engagement announced. Blair would notice. Blair also would not want to embarrass him. He cleared his throat. "You seem quiet. No reservations about the bride, I hope?" At last Blair looked at him, albeit reluctantly. "No. Miss Grey is a very suitable choice." That seemed an evasive answer. "Were there any problems with Sir William?" he asked, lowering his voice even further. Blair shook his head. "Come, man, what is it?" he prodded. "You look positively grim." Blair's chest filled as if he would speak, and then he sighed. "My apologies, Wessex," he muttered. "It must be the storm." Gareth closed his eyes and mentally smacked himself on the forehead; he'd completely forgotten Blair had been frightened of storms as a boy. Perhaps he still was, and now Gareth had just gone and forced him to admit it aloud. "Of course," he murmured quickly. "I wish you and Miss Grey every happiness," added his secretary with a forced smile. Gareth nodded, happy to let the conversation lapse. The carriage was almost to the steps, and for a second he wondered what he might have done if Blair had confessed some wariness about Miss Grey or the marriage in general. He couldn't very well just send her home, but it would have been gravely alarming had James found her wanting. There was a rustle of silk behind him. "I hope I'm not late," said his mother as she stepped up beside him. "Your timing is perfect," he said. "I presume Bridget had something to do with it." "As ever," she replied under her breath. Gareth shot his mother a quick glance. All three of his sisters were beside themselves with excitement over the impending celebrations and desperately eager to meet Miss Grey, the reigning toast of London. But while Serena and Alexandra were capable of proper, dignified behavior, the youngest had a true genius for trouble. If anything were to break, go missing, or inexplicably wind up on the roof, Bridget was sure to be found nearby, protesting—with a perfectly straight face—that the most incredible circumstances had caused it. Normally he took Bridget's mishaps in stride, but he would be eternally grateful if she managed to behave properly for the next fortnight. Perhaps he ought to tell Withers, the butler, to post footmen outside the guest rooms to make certain Bridget didn't accidentally inflict a broken leg or a black eye on the bride. "She'll be on her best behavior, won't she?" he asked, praying that would be good enough. "Yes." The duchess gave him a confident smile. "I've told her she will be excluded from all the wedding festivities if she is not. For now, I've sent her to help Henrietta entertain Sophronia." His shoulders eased. "A masterstroke." The only person more capable than Bridget of causing trouble was Sophronia, his great-great-aunt. Or was she a great-great-great-aunt? He tended to think of her in the same vein as the statues in the garden: ancient, crumbling, and utterly impervious to anything. Normally Sophronia kept to her own apartments with her companion, Henrietta Black. But if she and Bridget could occupy each other tonight, so much the better for everyone. "Never let it be said I don't know my children." His mother turned to face him and her gaze sharpened. "Do you love this girl, Gareth?" She only called him Gareth when she wanted to get his attention. His eyes narrowed, but he spoke calmly. "What has love got to do with marriage?" He knew it existed and that it was pleasant to find it in marriage, but he'd never met a woman who stirred him, even slightly, the way poets and romantics sighed about: the world upended, walking on air, being struck by lightning from a clear blue sky. Rubbish. Whatever else Gareth might have been amenable to, he preferred to keep his feet on the ground, and he most certainly didn't want to be hit by lightning. If such a force even existed, he was just as happy not to know about it. His marriage to Miss Grey would be elegant, refined, and sensible: in a word, perfect. "Don't scoff," said his parent. "You know I only ask out of concern. You've persuaded me the match is advantageous for both parties, but you've hardly said one word about your feelings for the lady herself." "She's lovely. She'll make a very suitable duchess and mother. You'll adore her." "I wasn't worried about my adoring her," replied the duchess. "I worry about you adoring her." His jaw tightened. What a time to ask that question. "I have the utmost respect for her, and I trust we shall be very content with one another." Irked at her and at Blair for ruffling what had promised to be a perfectly smooth welcoming, he descended the steps as the carriage reached the gravel and slowed to a more decorous speed. There was nothing to reproach in his actions. He was a sensible man who made logical decisions. He thought he'd chosen quite well, despite his mother's sentimental disquiet and his secretary's grim silence. If they had some objection to this marriage, he thought darkly, they had better speak soon or forever hold their peace. But this was not the moment to brood about that. Straightening his shoulders, he prepared to welcome his future wife and her family. Miss Grey, her parents, and her elder sister would spend the next fortnight at Kingstag, preparing for the wedding at the end of that time. Behind him, the butler, housekeeper, and a few servants waited at the ready to greet their soon-to-be mistress. The house had been cleaned and polished to a bright shine over the last month to appear at its best for the wedding. He darted a quick glance at his mother, but she silently stepped up beside him, her serene smile back in place, and he breathed a sigh of relief. The sky growled again as the coach pulled to a halt. A dust-covered servant jumped down to open the door, and Sir William alighted first. The baronet fairly radiated triumph. "A very great pleasure, Your Grace," he boomed, sweeping a bow as the servant turned to help Lady Grey down. "The pleasure is mine, sir. Welcome." Gareth greeted the older gentleman. "May I present my mother, the Duchess of Wessex?" His mother stepped forward and graciously greeted the baronet. Gareth turned his attention to Lady Grey. "Welcome to Kingstag Castle, madam." He bowed over her hand. Her pleased eyes climbed the façade of the house before she turned a beaming smile on him. "A pleasure it is to be here, sir. And for such a happy occasion!" She laughed, a little trill of delight. He smiled, then stepped forward to help his betrothed down from the carriage himself. Helen Grey was lovely, he thought approvingly as she stepped down, her small hand nestled in his. He'd thought so from the moment he met her. Her dark hair was arranged in the latest style, her dress the picture of elegance. She looked as fresh and beautiful as the roses in his mother's garden. The Greys must have stopped so she could change and refresh herself before arriving. "Welcome to my home, Miss Grey." He raised her hand to his lips as he bowed. She blushed, her cheeks a perfect soft pink. Her dark eyes glowed as she gave a little curtsey. "Thank you, Your Grace. I'm delighted to arrive at last." Gareth smiled in satisfaction. She truly was the perfect bride. Her voice was just as lovely as he remembered, and her person even lovelier. Her manner was gentle and sweet. What more could a man ask for in a wife? He presented her to the duchess, pleased to see his mother greet her as warmly and graciously as ever. He knew she would never be rude or crass, but he wouldn't put it past her to probe—in that delicate, almost imperceptible way she had—into Miss Grey's feelings as well. "How fortunate you arrived before the storm broke," he said to Sir William. "It's been threatening all day." "Yes!" exclaimed Lady Grey, fanning herself. "We were quite worried we would be caught in a downpour." "It looks to be a bad one," observed Sir William, squinting at the sky. "Indeed. Shall we proceed inside?" Gareth paused, remembering something. "But did you not say your eldest daughter would also be accompanying you?" A moment of silence passed over the group. Sir William and Lady Grey exchanged a glance. Miss Grey wet her lips. "Yes. My sister did come. She wanted a moment to repair her appearance, I believe." "Ah." Gareth nodded, and turned toward the carriage again, wishing the sister would hurry up and get down so they could step inside before the rain came and soaked them all. How long did she need to repair herself, anyway? Miss Grey managed to look as neat and elegant as any lady in town. "I'm coming," said a voice from the carriage. "Just a moment!" She appeared in the door of the carriage, her face hidden by a dark red bonnet. She gathered up her vibrant yellow skirt in one hand and reached out to take the hand of the footman waiting to assist her. "So sorry to keep everyone waiting," she said a bit breathlessly as she jumped down and faced them all. She looked like her sister, but different. Where Helen Grey's face was tranquil and composed, this woman's face was lively and expressive. Her eyes sparkled and danced. Her features were sharper than Helen's and her figure was fuller, almost lush. And as she tipped up her pointed chin and looked at Gareth with openly interested brown eyes, lightning struck.